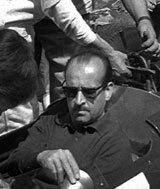 Maurice Trintignant had a long career by the standards of his era, racing in Formula One from the inaugural season in 1950 through to 1964, winning twice in 84 starts for no fewer than ten different teams. A street-racing specialist, he won at Monaco for Ferrari in 1955 and then at the same venue in a Rob Walker Racing Cooper three years later. He also won three non-championship races in the 1950s and the Le Mans 24 Hours in 1954. When he briefly replaced Stirling Moss in 1962, he was still sprightly enough to show Jim Clark the way at the non-championship race at Pau, but it proved to be his last competitive year and he quit in 1964. In retirement he made wine near the town of Vergèze, in the Languedoc-Roussillon region, eventually being elected mayor. he died, aged 87, in 2005.